Bathing suits designer Dolores Cortés presented her collection for next summer at Mercedes Benz Fashion Week Madrid. Inspired by Japanese culture, Tokyo, the manga universe and the samurai, Dolores Cortés showed off her swimsuits, bikinis and trikinis in pastel colors, like origami figures or pieces of black and red armor. The result is a modern and refined collection that integrates Japanese aesthetics in western culture. Another year featuring exclusive pieces of jewelry from El Mito de Gea and striking yellow wedges by SixtySeven. Accessories influenced by the art of origami. A mix of materials with combinations of gold plated metal and multi-colored motifs. All the models wore ankle boots with high wedges and gold iridescent laminate design. 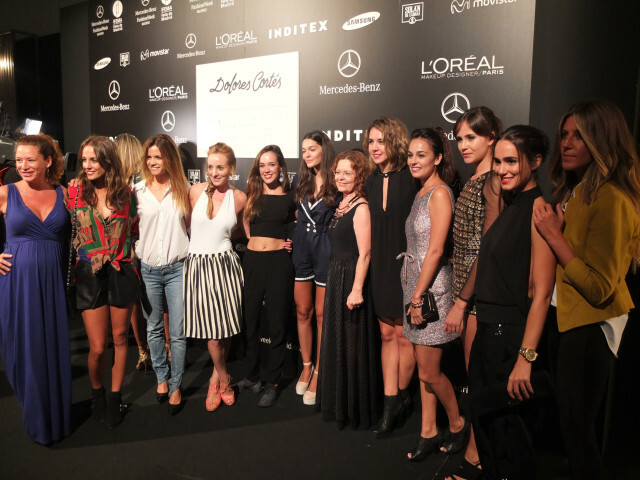 In the front row were many familiar faces, such as actresses Andrea Guasch, Ana Rujas, Alicia Sanz, Angela Cremonte, Eva Almaya, Lucía Ramos o Andrea Dueso with host Cristina Pedroche and Natalia Alvarez.